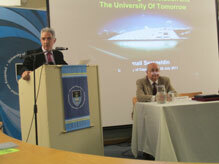 A lecture theatre at the University of Cape Town (UCT) law school was packed to the hilt yesterday as Professor Ismail Serageldin, Director of the Library of Alexandria in Egypt, delivered the Vice-Chancellor’s Open Lecture here. 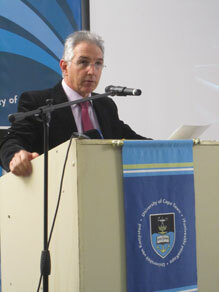 Prof Serageldin’s lecture formed part of his journey to South Africa to present the Ninth Nelson Mandela Annual Lecture, which took place on July 23, 2011 at Johannesburg’s Linder Auditorium. The topic today was “Universities and the Unfolding Knowledge Revolution: Preparing for the 21st Century”. Professor Njabulo Ndebele, former vice-chancellor of UCT and a member of the Nelson Mandela Centre of Memory Board of Trustees, opened proceedings by giving background on the Nelson Mandela Centre of Memory and discussing the significance of Prof Serageldin’s visit to the country. The Nelson Mandela Centre of Memory seeks to contribute to a just society by promoting the vision and work of its Founder, and convening dialogue around critical social issues. 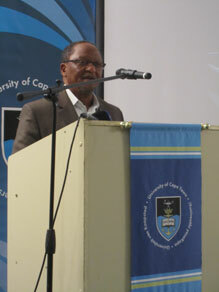 The annual lecture series, now in its ninth year, “promotes this vision” said Prof Ndebele. 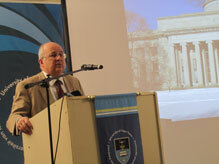 Vice-Chancellor and Principal of UCT, Dr Max Price, introduced Prof Serageldin. Running through Prof Serageldin’s résumé – he has published more than 60 books, over 200 papers, has received 29 honorary doctorates, chairs a number of advisory committees for academic, research, scientific and international institutions and civil society efforts, has served the World Bank and is the first director in 1 600 years of the Library of Alexandria – Prof Price pointed out that “the variety of [Prof Serageldin’s research] subjects is the most striking”. 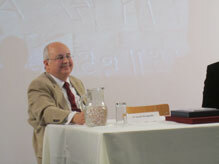 Among the foremost changes the world faces in the 21st Century is what Prof Serageldin calls the “knowledge revolution”. “We are living the most profound revolution in the structure of knowledge since the invention of writing.” He calls the internet a “transformative invention”, and likens it to the influence that the invention of the printing press had on the Industrial Revolution. New technology also means new ways of doing things. Prof Serageldin used Wikipedia (where “100 000 people who don’t know each other” built the ’Net’s largest repository of (mostly) substantiated information) and the BA Science Supercourse (a project designed to network scientists and to empower educators around the world through the sharing of scientific lectures online for free – it currently serves 1-million students in 175 countries) as examples of new knowledge distribution methods. Comparing today’s knowledge environment to just 15 or 20 years ago, Prof Serageldin pointed out some of the major changes occurring now. Texts, as we know them on the web, are alive in that they grow and change; information exists in living, vibrant, constantly reorganised systems. Soon, he said, analysing and reorganising of information will be continuous, and language will no longer be a barrier. Humans’ relationship with machines will only deepen. We “will need machines to access, retrieve, manipulate and add to the body of knowledge” more and more, said Prof Serageldin. It is therefore imperative that the digital divide in developing nations be closed. The effect of this knowledge revolution on education is manifold and complex. Storage and retrieval of information will go from analogue to digital – last year the first bookless library was established at the University of Texas at San Antonio; in April this year e-books outsold paperback copies for the first time. New collaborative ventures will arise: The World Digital Library, for example, is a joint effort between 95 libraries in 63 countries that curates and hosts the best texts from those libraries. It is also a memory project, and it has global reach. Moving away from the primary-secondary-tertiary school model, education and learning will be lifelong and continuous; humanities will come into their own along with science; self-learning and distance-learning will increase; and organisations will be both real and virtual, but infinitely more flexible. 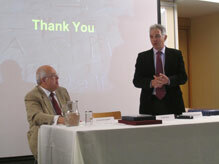 Prof Serageldin’s audience was riveted and there was much applause and discussion after the lecture. Many of the audience members scrambled to the front to ask questions and to greet him. The diversity of the audience – which included Justice Albie Sacs, school learners, retirees, journalists and students – and their unfailing attention attest to the far-reaching relevance of Prof Serageldin’s inimitable insight, experience and wisdom. This lecture was made possible through the support of SAP as primary donor with supporting contributions of the Swedish Postcode Lottery and the Coca-Cola Foundation.